In Guatemala, the fixed-line market is gradually shrinking, with the mobile sector gaining momentum. The penetration of cellular communication in the country is 109%, which is more than 18 million connections and opens wide opportunities for starting a voice termination business. 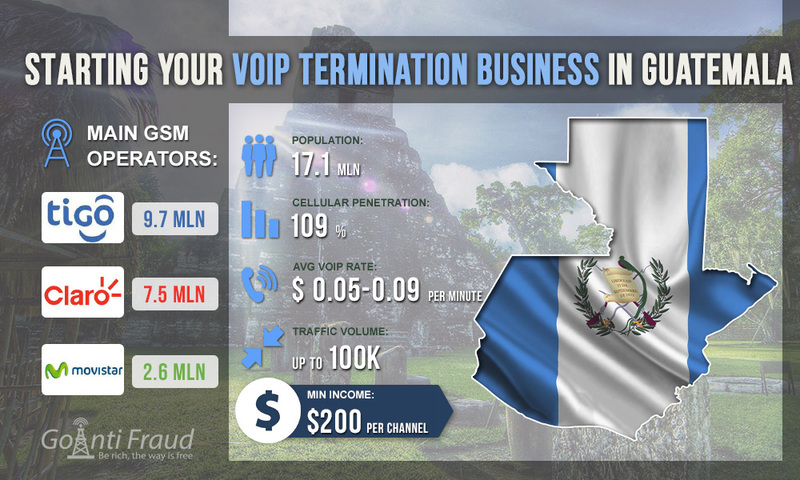 At the same time, average voip rates to guatemala range from $0.05 to $0.09 per minute. The mobile sector is the most developed among all sectors of the telecommunications market in the country. Intensive competition between three GSM operators has improved the quality of provided services and reduced tariffs on cellular communications. The level of mobile penetration is approximately equal to the average for the region. The leader of the mobile communications market is Tigo as its subscriber base consists of more than 9.7 million users. Tigo provides the best coverage in the country. Claro (7.5 million) occupies the second place, the third - Movistar (2.6 million). One MVNO (virtual provider of cellular communication services) also operates in the country. The cost of a SIM card in Guatemala is on average $3- $6, and it often provides for initial credit and bonuses. Starter packages in the country are called "chips". They are sold not only in the branded stores of operators but also in other outlets. By law, to purchase SIM-cards you need to show your identity card, but in fact, you can purchase numbers without having to produce your documents. Since cellular operators are actively competing with each other, communication services in Guatemala are inexpensive. There are many promotional offers, as well as unlimited packages. You can use them to make calls at up to $0.004 per minute. When you terminate voice traffic for 5 hours a day, you will earn at least $200 per port.